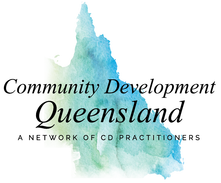 ​A tradition of community development has evolved in Queensland since the 1970s with many practitioners trained and/or mentored by people including Les Halliwell, Anthony Kelly, Sandra Sewell, Carmel Daveson, Bea Rogan, Dave Andrews and many others. Elements of this method of community development practice are about moving from a private concern to public action. It is a relationship-based method underpinned by guiding principles (see Lynda Shevaller's 2015 Les Halliwell address). building relationships between people to share power and resources. act, with others, in relation to things which concern them. Problems we experience in our personal lives often have wider social causes. Personal experience and personal knowledge is always the starting point for community development. When we act with others to address the social causes we improve our own and others' lives. Every little step we take makes a difference. Tiny little steps are best! Every step beyond ourselves is a step inside ourselves. As community development practitioners we are influenced by the values that we, as individuals, hold. There is often a great deal of debate about values and principles and what they mean. ​“Good practice has its roots firmly located within core values, which are ideals we hold, and practice principles, which are ways we are committed to act. From these values and principles, all developmental practice flows.” (Lathouras 2010:16). Reference: Ingamells, A., Lathouras, A., Wiseman, R., Westoby, P. and Caniglia, F. (eds), 2010, Community Development Practice: Stories, Method and Meaning, Common Ground Publishing Pty. Ltd. Melbourne. 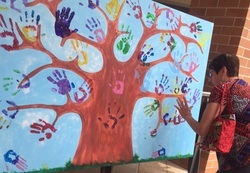 Underpinning values: human dignity and worth, integrity/involvement, belonging, reconciliation, cultural diversity, social justice. From Chapter 2 'Developmental Community Work - A Method' (Lathouras, 2010, pp. 11-28). Reference: Ingamells, A., Lathouras, A., Wiseman, R., Westoby, P. and Caniglia, F. (eds), 2010, Community Development Practice: Stories, Method and Meaning, Common Ground Publishing Pty. Ltd. Melbourne. ​We all need to reflect on our core values and then draw principles from our values, as a principle is a pathway to action. Community development practitioners have the capacity to influence individuals, organisations, sectors and systems. The principles which underpin our work will shape the direction of that influence.